This is the first book to successfully increase my chill. Pick it up if you need an alternative to the nightmare/labyrinth/fugue state/series of disappointments you're stumbling through now. Bonus: Watts' writing is friendly, funny, and often beautiful. We live in an age of unprecedented anxiety. Spending all our time trying to anticipate and plan for the future and to lamenting the past, we forget to embrace the here and now. We are so concerned with tomorrow that we forget to enjoy today. Drawing from Eastern philosophy and religion, Alan Watts shows that it is only by acknowledging what we do not—and cannot—know that we can learn anything truly worth knowing. In The Wisdom of Insecurity, he shows us how, in order to lead a fulfilling life, we must embrace the present—and live fully in the now. Featuring an Introduction by Deepak Chopra. 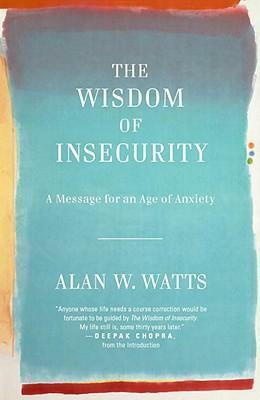 Alan W. Watts, who held both a master’s degree in theology and a doctorate of divinity, is best remembered as an interpreter of Zen Buddhism in particular, and of Indian and Chinese philosophy in general. Standing apart, however, from sectarian membership, he has earned the reputation of being one of the most original and “unrutted” philosophers of the twentieth century. Watts was the author of some twenty books on the philosophy and psychology of religion that have been published in many languages throughout the world, including the bestselling The Way of Zen. An avid lecturer, Watts appeared regularly on the radio and hosted the popular television series, Eastern Wisdom and Modern Life, in the 1960s. He died in 1973.